'S e 18 an t-Sultain an 261mh latha dhen bhliadhna a rèir a' Mhìosachain Ghriogaraich (262mh ann am bliadhna-leum). Tha 104 latha air fhàgail gus deireadh na bliadhna. 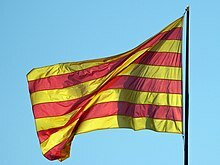 1916‎ - an latha mu dheireadh de Bhlàr an Somme anns an deach barrachd is millean a mharbhadh no a leòn. 1997 - As deidh reifreann, thaghadh na Cuimrich seanadh ùr. 2014 - Referendum air Neo-eisimealachd na h-Alba 2014. 53 – Trajan, Impire Ròmanach. 1765 - Bartolomeo Alberto Cappellari, ann am Belluno. Pàp bho 1831 gu 1846. 1858 - Pedro Nel Ospina Vásquezann am Medellín. Neach-poileataigs à Coloimbia. 1890 - Bep Schrieke, ann an Zandvoort. Neach-poileataigs às na Tìrean Ìsle. 1905 - Greta Garbo, ann an Stockholm. Actair às an t-Suain. 1907 - Edwin Mattison McMillan, ann an Redondo Beach. Ceimigear às na Stàitean Aonaichte. 1961 - James Gandolfini ann an Westwood. Cleasaiche às na Stàitean Aonaichte. 1894 - Rafael Núñez Moledo, ann an Cartagena de Indias. Saighdear agus fear-poileataigs à Coloimbia. Air a tharraing à "https://gd.wikipedia.org/w/index.php?title=18_an_t-Sultain&oldid=543690"
Chaidh an duilleag seo a dheasachadh 18 dhen t-Sultain 2018 aig 06:43 turas mu dheireadh.